Showcase your business in front of over 800 families in the Denham Springs area while supporting literacy and education at the same time! 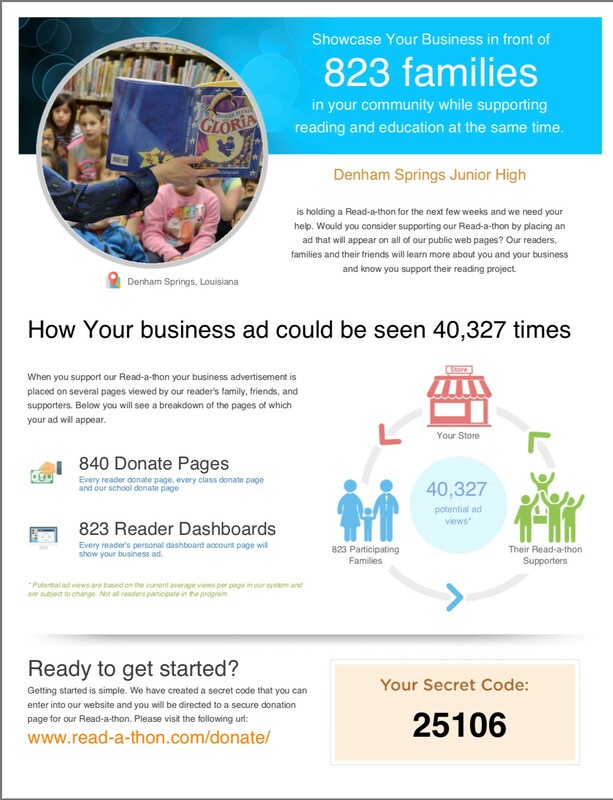 Would you consider supporting the Denham Springs Junior High Read-a-thon by placing a business ad that will appear on all of our public Read-a-thon web pages? Our readers, families, and friends will learn more about your business and know you support their reading project! Your business as could be seen a total of 40,327 times through our Donate Pages and Reader Dashboards! Money raised will go toward replenishing the 23,000 library books that were destroyed in the 2016 flood. Go to www.read-a-thon.com/donate and enter code 25106 to place your ad.